OKLAHOMA CITY (March 30, 2017) — Remember pizza day in the school cafeteria? Fast forward to 2017: How does Asian beef stir fry sound? If you ask students at Okmulgee High School, they’ll tell you it’s amazing. What’s the secret behind this new crowd favorite? Her name is Valarie Carter, and she’s one of several Cooking for Kids chefs. “We go in and train and retrain staff in kitchens at public schools all over Oklahoma,” said Carter. Cooking for Kids is the brainchild of the Oklahoma State Department of Education’s Office of Child Nutrition. The program is funded by the United States Department of Agriculture (USDA). 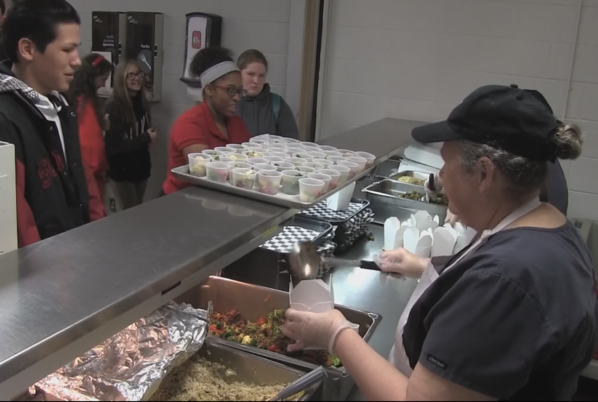 Thanks to a contract with the Oklahoma State University Extension Division, schools are learning to cook healthier. Okmulgee was one of several districts to take part in the Cooking for Kids summer training session. Twenty-six schools were later chosen to have a chef come to their cafeteria throughout the school year. The results have been delicious. Watch ELEVATE: Cooking for Kids to learn more about the program and how your school can get involved. Cass Ring, Education Outreach Coordinator, (405) 744-2438 or cass.ring@okstate.edu. Visit the Cooking for Kids website, www.cookingforkids.ok.gov.